June 28, 2016 — On Saturday, April 16, a magnitude 7.8 earthquake struck the northwestern coast of Ecuador, killing hundreds and injuring thousands. The quake–the worst to hit the country since 1987–leveled buildings, destroyed roads and bridges, damaged structures and triggered landslides. Reports estimate that upwards of 73,000 people were displaced while more than 7,000 buildings–560 of which were schools–were either damaged or destroyed. Within days of the earthquake, Operation USA’s partner organization, All Hands Volunteers, arrived in Ecuador to assess the damage. The team quickly recognized that coastal communities in the province of Manabi had suffered extensive damage, yet were lacking much-needed support in order to provide shelter for the many people displaced by the disaster. Finding secure, permanent housing is the cornerstone of long-term recovery for these families, who will need a solid footing to focus on other recovery needs, such as livelihoods and education. 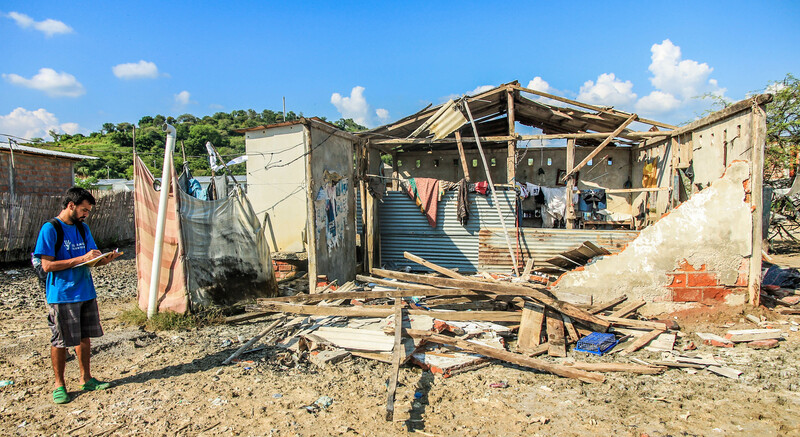 As is the case in many rural communities that are overlooked and under-served in the wake of disasters, many families in the Manabi Province will rely on support from humanitarian groups to rebuild their homes and begin the recovery process. All Hands Volunteers has focused initial recovery efforts on the rural communities located near the town of Canoa (in Manabi Province). There, utilizing teams of volunteers and working directly with affected community members, they plan to construct 13 permanent homes for displaced families. The project delivers each family a new home, builds the capacity of local artisans, teaches the community about earthquake resistant construction methodologies and has a structured approach to developing greater community spirit. Operation USA is proud to provide funding to All Hands Volunteers for this project, thanks in large part to donors who made donations and provided gifts in the immediate aftermath of the earthquake. In June, OpUSA delivered a grant in the amount of $57,765 for the construction of 11 of the planned homes. As time and funds allow, All Hands will build additional homes in the community of Canoa and other areas in need within Ecuador. Thank you to all our supporters for your generous contributions in support of Ecuador earthquake recovery. To support the construction of additional homes and to allow for additional shipments of relief materials to affected areas, donate today. All Hands Volunteers is a US-based, 501(c)3 non-profit organization that addresses the immediate and long-term needs of communities impacted by natural disasters by engaging and leveraging volunteers, partner organizations and local communities. Since its inception following the Indian Ocean earthquake and tsunami in 2004, All Hands Volunteers has responded to 65 disasters worldwide, engaging 35,000 volunteers and donating over 180,000 days. Philanthropic leaders say the organization is known for being nimble, collaborative, and professional in its response to the immediate and long term needs of those suffering in the aftermath of a natural disaster.